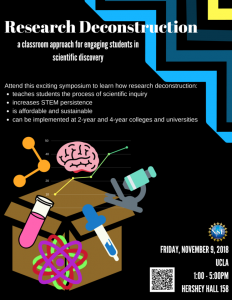 We invite you to this symposium at UCLA to learn about research deconstruction, a low cost, high impact pedagogical strategy developed at UCLA to engage novice undergraduate students in the process of scientific discovery. Research deconstruction requires no laboratory or textbook, making it affordable and sustainable for departments and students at a wide range of institutions, from R1 universities to 2-year colleges. Guided in‑depth analysis of a bona fide research seminar is used as a platform to teach fundamental concepts, experimental methodologies, and importantly, the logic of scientific investigation. Implementation over a 10-year period at UCLA suggests that research deconstruction is effective at both teaching students the process of scientific inquiry and increasing persistence in STEM. At this symposium, educators from UCLA, UC Santa Cruz, University of Toronto and Santa Monica College will share insights, challenges and best practices from their experience using research deconstruction. If you would like to learn more about this pedagogy and potential partnerships to assist with implementation, please consider attending. Educators at community colleges are especially encouraged to participate and we hope that Chairs will consider applying attendance of this symposium toward the professional development requirement (flex time). Please feel free to share this with any interested colleagues.